Be the first to share your favorite memory, photo or story of Arti. This memorial page is dedicated for family, friends and future generations to celebrate the life of their loved one. 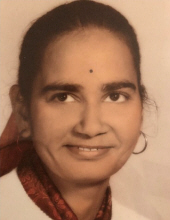 Arti Baranwal, 76, of Akron, OH, died on January 24, 2019 at her daughter’s home. She was the beloved wife of the late Dr. Krishna C. Baranwal. She was born in Shikohabad, India on December 27, 1942, as the youngest of 5 daughters, to the late Harish Chandra Gupta and Sushila Devi Gupta. Arti achieved her Master’s degree in Sociology from Narayan College in India. She was a loving homemaker, wife, mother and grandmother. She enjoyed cooking, crocheting, and needlework. She loved to sing, do word search puzzles, and care for her family. She is survived by her 2 daughters, Dr. Rita Baranwal and husband Peter Johnson of Gibsonia, PA, Dr. Seema Baranwal and husband Ashish Chawla of Bryn Mawr, PA, 5 grandchildren Sanjay and Amiya Johnson, Sachin, Dilan and Lily Chawla, and a sister Pramod Gupta of Agra, India. She was pre-deceased by a daughter Geeta Baranwal, and 3 sisters Vinod, Simi, and Simlesh Gupta. Relatives and friends are invited to her Viewing from 4-5 p.m. followed by the Funeral Service at 5:00 p.m. on Sunday, January 27, 2019 at the Emil J. Ciavarelli Family Funeral Homes and Crematory, 516 Fayette St., Conshohocken. Interment will be private. Condolences may be made at www.ciavarellifuneralhomes.com. To send flowers or a remembrance gift to the family of Arti Baranwal, please visit our Tribute Store. "Email Address" would like to share the life celebration of Arti Baranwal. Click on the "link" to go to share a favorite memory or leave a condolence message for the family.